Preheat the oven to 200˚C. Line a muffin tray with cake cases. Pick over blackcurrants, rinse and toss in brown sugar. Cream the butter and sugar together until light and fluffy, and beat in the eggs. Then gradually add the flour and baking powder. Stir in the blackcurrants and flaked almonds. Spoon the mixture into the cases then bake in the oven for 15-20mins and then allow to cool in their cases on a wire tray. 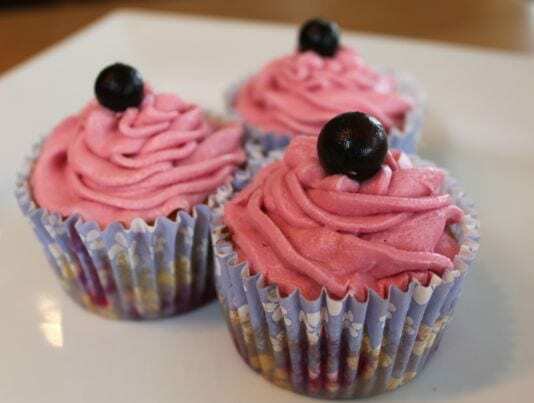 To decorate, beat together the icing sugar, butter and blackcurrant puree to make a soft icing which you can either pipe or spoon on the top of each cake. Finish with a blackcurrant!